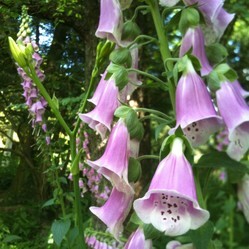 Every early summer, one of the flowering plants I most look forward to seeing in bloom is the foxglove. With its tall spires of pastel, tubular flowers, this plant can make a striking addition to any home garden. It is also reasonably simple to establish and care for, being a biennial which spreads itself easily and quickly through the years. However, foxglove plants are also highly poisonous and some consideration needs to be given to their placement in areas where small children or animals may be exposed to the plant. Every single portion of the plant is toxic, from its leaves to its seeds to even its root system. Yet foxglove, known formerly by the genus Digitalis, is also responsible for the important pharmaceutical product of the same name. Read on to learn more about this beautiful flower, as well as enjoy photographs of them in bloom. You will also find links for buying seeds and established plants for your own garden. The name Digitalis means "finger-like" and refers to the way in which a foxglove flower can easily fit over a human fingertip, like a miniature glove. Foxglove is native to several geographic regions - western and south western Europe, western and central Asia, and northwestern Africa. However, it can thrive in nearly any climate and region hence its worldwide popularity today. In regions that experience high heat, foxglove do best in the shade, but in most other regions it thrives in full to partial sun. These plants like well-drained, acidic soil that is rich in humus. Once established, they can tolerate dry shade as well. Foxglove plants are biennials grown from seeds, which generally will not produce flowers nor seeds until their second year. The best way to establish a thriving bed in your garden to bloom every year is to begin with some mature plants purchased from a nursery (or ordered on-line), planted at the same time as you scatter seeds. That way you will have a sequence of blooms every year, as some plants mature, flower and propagate seeds as others are just beginning to grow. A very hearty foxglove plant may even come back for a second year of blooming or more - it depends on the weather and conditions; I now have a number of plants at my home that are blooming for their second year and taller than ever before - over 6 feet! The most common ornamental variety of foxglove is the Digitalis purpurea - that is, the "Common foxglove." It produces flowers that range in shade from white and gray to purple and pink. Other varieties produce different color blooms, including yellow. Foxglove are generally tall plants once they reach their blooming times, with spires of flowers that can tower 2 to 5 feet high. Therefore they are a good choice for the back row of a garden where they can be established easily, with smaller annuals or spring bulb plants in front of them. Foxglove plants typically bloom in early summer, but may have a second bloom in the fall after producing its first blossoms and seeds. Start your own Foxglove garden! Will Foxglove Bloom Every Year? Yes - if you stage your foxglove with plants and new seedlings at the same time. Foxglove are biennials which take 2 years to flower, but will reseed themselves as long as you allow them to go to seed after blooming. However, cutting stalks will encourage additional flower stalks to grow. Is The Foxglove Plant Poisonous? Yes! Although foxglove plants attract birds and bees to your garden, they can be very dangerous to other animals - and humans! Every portion of the plant is dangerous if ingested - the leaves, the flowers, the seeds, even the plant's root system. Reports have even been made of poisoning simply by inhaling the spores produced by its seed pods. With this in mind, care should be taken if you have young children in your home, who may not understand the dangers of touching or eating outdoor plants. Small animals and pets could be at risk as well. In centuries past, foxglove was utilized by herbalists and folk doctors, yet even they recognized the dangers and volatile properties of it if overdosed. Today, digitalin is scientifically extracted from foxglove and used as a treatment for heart conditions, as it can successfully control heart rate and increase the ability of the heart to contract. However, too much digitalin can cause side effects including nausea, vomiting, diarrhea, jaundice and blurred vision. Should Foxglove Plants Be Banned? Is it simply too poisonous for our gardens? In researching some additional material for this page, I stumbled upon the page Foxgloves - Beautiful, but Deadly! where numerous people have left comments describing reactions and medical emergencies caused by handling of these plants or inhaling the seeds. Some of the individuals on the page believe that foxglove should be banned from sale in garden centers, and that no one should be allowed to grow it because of the poisonous dangers to animals, adults and especially children.But what do you think? Should this flower be banned, or should people just be more educated about the potential hazards of it? It is a matter of public safety or personal responsibility? What is your opinion on the matter? Do you feel that growing and selling foxglove plants and seeds should be banned? You can check out these helpful links for more growing, planting and historic information. Wikipedia's page devoted to the plant. Learn more about gardening, lore and history. Gardening page devoted to care and propagation. Gorgeous photos of this plant on Flickr. Website devoted to herbal plants, with a page dedicated to this beauty. Thank you for visiting my page about foxglove. Please leave a comment if you've enjoyed it and have any comments you'd like to add. I read cozy murder mysteries, especially ones set in the U.K., so am quite familiar with foxglove and how you can poison someone with it. But there are all kinds of other poisonous plants, mushrooms, and even household cleaners. We can't ban everything that is dangerous because they often have good properties, too, if used correctly. Education is they key. Excellent photography. These appear to be around one house, so they were probably done at one time.